This page carries updateｓ of project developments, progress, complaints, violations, etc. Newest entries are at the top. People may find this documentation useful to imagine what a major construction project near them would mean. The major impact zone is a couple blocks’ radius from any construction site, but depending on the project could be less or more. Feel free to quote and refer to this in any public hearing or public meeting for a rezoning or development. This is the real experience in a real case, with a project by one of Canada’s top developers (Westbank Projects Corp., with contractor ICON, financed by Peterson Investment Group, and designed by Henriquez Partners Architects). See project schedule here. In the future, this case study may be useful for negotiations with the City of Vancouver or industry organizations to improve standards and legislation. Things we are watching for include (1) good/bad practices (safety, respect for neighbourhood, impact mitigation, community engagement/communication), (2) legal compliance, (3) impacts on livability of neighbourhood during construction, and (4) regulatory gaps and shortcomings. 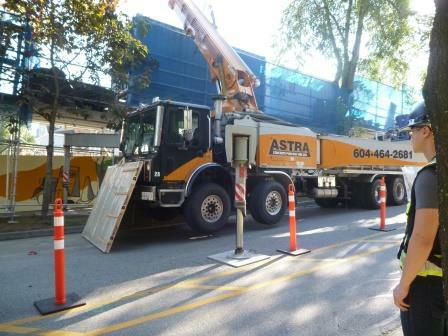 For example, from this case study we have already noticed specific examples of bylaw violations, failure of the City to monitor and enforce adequately, the fact that Vancouver has substandard legislation relating to ground vibration from construction, and that the entire construction industry has a structural problem due to a mismatch between equipment technology and noise bylaws (the concrete pumping trucks used in concrete construction operate at noise levels above the 85 decibel limit — so they are probably violating legislation frequently all over the city). 3-Jun-2014. Tuesday. Big machines started up at 7:30 sharp. Jackhammers sounding like machine guns. Loud machines. Not a nice way to be woken up early for people on shiftwork or home bound. 2-Jun-2014. Monday began with jackhammers, diesel fumes in the neighbourhood, road and lane blockages, heavy equipment running. It appears to be still for water system hookup to the Westbank building. 31-May-2014. Jackhammer work continued on this sunny Saturday, audible for many blocks around, for thousands of people. 30-May-2014. Jackhammer noise reverberated through the West End much of this otherwise-lovely spring day. This time the noise is from City of Vancouver workers preparing to install water mains to the Westbank tower. Water service will be cut off to adjacent buildings on Monday. Are developments like this 22-storey tower paying their way in additional infrastructure costs? Or are other taxpayers footing the bill? Some drivers were frustrated by being blocked into the lane with no way out, due to this work today. Just another day of disruptions on the neighbourhood. 28-May-2014. The crane was completely dismantled the week of May 12. The work took several days. This project is annoying neighbours again today. Cement trucks and a large boom truck — noise audible for a few blocks away all day long, a constant invasion of mental space. At 7 pm the mixer gives off a loud and steady drone, while the boom truck gives off a loud noise every second or so. The sound bounces off buildings. On otherwise sunny afternoons now, the extent of shadowing is clear. The mini-park in front of Gordon Neighbourhood House will never again have direct sunlight where children used to play in the afternoon. The dark shadow extends to what would otherwise be bright greenspaces as far as Barclay Street and beyond. The main structure of the 22-storey tower is complete. It looks much more than three storeys taller than the 19-storey tower across the lane. Experts in the building design industry have been criticizing the architectural design (http://forum.skyscraperpage.com/showthread.php?t=138107&page=545). Exterior finishing is underway. Interior materials are being hauled in, including drywall for walls, and fixtures. All windows are now installed. Exterior balconies do not yet have rails. There is still much vehicle traffic for this site, vehicles of all sizes for delivery and removal. Workers continue to be observed parking illegally in permit-only spots. With earlier light in mornings, neighbours notice more activity around the site before 7:30 am. Occasionally neighbours have altercations with workers for blocking the roads. The rear lane is closed today by City workers — possibly to tear it up for drain/sewer/waterworks. Is the development paying its fair share for these extra costs? Quoting from a frustrated community member: Many property owners and residents have been impacted for so long due to a rezoning that should never have happened. And what benefit do we get? Nothing. This city block has lost about 10 parking spaces on Comox and now about another 10 in the lane.” Others know that the building will have underground parking for only about half of the 193 units in the building, and fear an even more serious shortage of parking here one “The Lauren” opens. 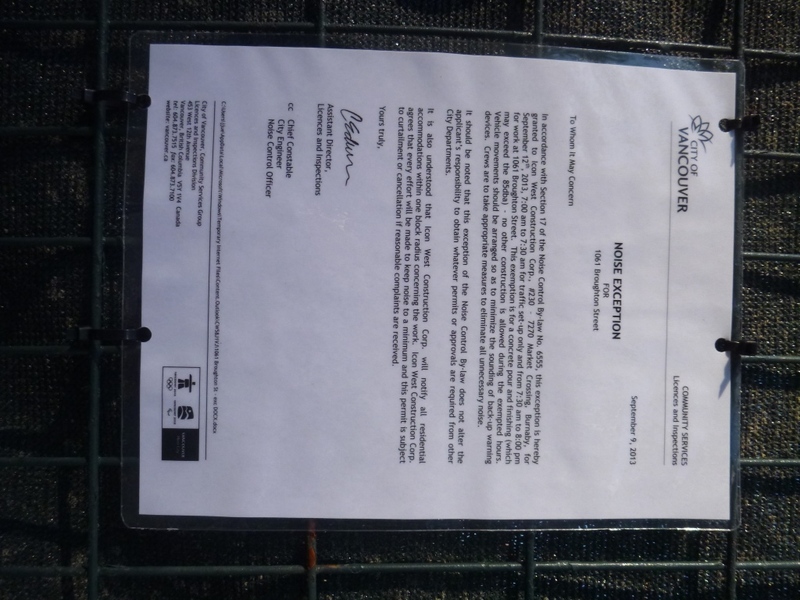 As for communication, ICON Pacific, the site general contractor, periodically posts notices on the doors of apartment and condo buildings immediately adjacent to the site. Other than that, there has never been any organized communication with the neighbourhood. ICON Pacific still has its own website “under construction” — so clearly it provides no information to the community by this means. 12-May-2014. Today the construction crane is in the final stages of being removed. Work began on Saturday, May 9, for the crane to come down. Through April, work continued on the building. Windows went up. The 22nd storey was completed. No major incidents, but there was regular truck traffic with deliveries and debris removal. Noise levels were lower than in previous months, as their was less concrete to pour at this stage. Advertising is getting ramped up. 4-Apr-2014. In the past 5 weeks, construction has continued. Today the tower is up to about 20 or 21 storeys. Work has continued six days a week, with banging, clanging, traffic and truck noises. Most noticeable is the morning when the neighbourhood would otherwise be quiet. Often workers start hammering metal and wood at the stroke of 7:30 am, the earliest permitted by noise bylaw. Lights on each floor make the building stand out at night as a construction site. Noises remind people for blocks around that they live in a construction zone. When the cement trucks come by, their engines run at very close to the maximum permitted level of 85 decibels. T he first indication that the Westbank brand is associated with this project appeared about a week ago, with a white tarp hung over the corner of Broughton and Comox, proclaiming rentals available. Website http://www.thelauren.ca. The letters are the smallest thing on the sign. Other than that , it seems almost as though Westbank has completely avoided associating its brand — with not a single indication that it is connected with the actual project site. However, the letters ICON recently appeared in 4-foot-high letters, one to a floor, on the same corner. As has been the case for several months, their website is still under construction. http://iconpacific.ca/. One wonders what’s with that. 27-Feb-2014. Health and livability impacts on neighbours is not being measured quantitatively or systematically, but the costs of this project are not insignificant. The noise continues today on an otherwise quiet and sunny afternoon. Three cement trucks were on location–one feeding the crane bucket and two waiting, though they could be courteous and shut of their motors, they never do. 26-Feb-2014. A citizen called 311 City Hall to complain about the constant loud noise from the site. Even if the work is not violating noise bylaws, the disturbance imposed on the community is real, affecting sleep for people who may have shift work, be ill at home, or be home for other reasons. A sound measurement was taken today at about 6 pm. On a quiet street a couple blocks away, the reading was at 60 decibels. On the sidewalk across from the site, the lowest reading was 75 decibels. Three cement trucks were idling at this time. Each truck alone idles at at least 70 decibels several meters away. When all three are idling the ambient noise in the community goes up. When one of them is speeding up the rotation of the tank, noise volume skyrockets. And a truck starting up from being stationary to drive out along Broughton was measured at 86 decibels from the sidewalk, exceeding the 85 decibel limit under the noise bylaw. How is any community compensated for this long-term imposition on the livability of the community? This is a topic for negotiation between citizens, the industry, and the city. In some countries, the construction firms pay “apology money.” Stay tuned for more on that. 25-Feb-2014. ICON Pacific website still is “under construction.” No information about the company or about this project is available online for the affected neighbourhood. Marks for public communication and outreach: Fail. 24-Feb-2014. During a day of snowfall, the sounds of pounding and banging punctuated the otherwise pleasant neighbourhood atmosphere, reverberating for blocks. The tower now appears to be approaching 18 stories. 22-Feb-2014. A resident who lives a block away from the construction site, along Broughton Street, described mental and physical health disruptions as a result of this project. Concrete dust in apartment. Sleep disruptions due to construction noise and traffic. Stress and general frustration from constant noise, traffic, ground vibrations. This is an example of the negative impacts on the general community, with no compensation. Workers at the site violated permit parking regulations at about eight spots on Broughton Street. The project owners failed to pay for parking this day, and failed to monitor where their workers were parking — with the effect being that local residents were cheated out of parking space, and the City of Vancouver was cheated out of revenues. One wonders how often this behaviour occurs unnoticed. In effect, this is just another example of the public subsidizing private profits, with the project owners getting away with it whenever they can. 20-Feb-2014. The tower is at about 17 stories now and already appears to be near or taller than the 19-storey building across the lane. When the new one is completed at 22 stories, it will really stand out above what was originally permitted here, at six storeys. On sunny afternoons now, the extent of shadowing is becoming apparent across Nelson Street and beyond, as the shadow moves across the ground and local buildings. Westbank continues to stay out of public view at this project, perhaps afraid of damaging its brand here. The company name is completely absent from sight. Day after day, six days a week, typically from the earliest permitted hour, the community is reminded that the neighbourhood is a construction zone — with scores of truck deliveries and traffic, workers flowing in and out, the odors of curing concrete wafting a few blocks away, plus all the sounds (banging, clanging, yelling, whirring, pounding, and the cement trucks running near the permitted noise limit of 85 decibels). Work often continues after dark. Trucks related to the project are often seen parking without a permit. Often, there are no empty parking stalls for a few blocks around. What will happen when this project opens, without adequate underground parking for its own residents? 18-Feb-2014 (approx date). An object fell to the ground on the lane side of the building, from about the 13th floor. It struck the power lines before falling to the ground. Several workers observed as it went down. It appeared to be a wooden plank or board about 20 feet long and a couple feet wide. The next day, green curtains went up, covering about 7 floors of the building on the lane side, from about the 13th floor down. 15-Feb-2014. A professional window installer observed that the type of windows being installed appear to be one of the least expensive and least energy-efficient models available, speculating that this is a cost-saving strategy at the construction phase, but energy efficiency over the life of the building will suffer. 5-Feb-2014. Under clear, cold skies, construction continues from 7:30 am til after dark typically ending between 6 and 8 pm. The building is now up to about 15 storeys, though they seem to be higher than 15 storeys of the building across the lane. Does this building have generous floor-ceiling heights? Also, as temperatures are below zero this week, thousands of people are forced to endure the constant whine, similar to a distant turbine engine, 24 hours a day. Last night, the sound of the heaters on the freshly-poured concrete was at 68 to 70 decibels through the night, while people slept. Audible inside buildings. Steady, midnight, 1, 2, 3, 4, 5, 6 am and all through the day. Once daytime work began, on top of the 68-plus decibels was added the sound of two concrete mixer trucks supplying concrete to the crane bucket — running very near or even above the legal limit of 85 decibels. A drone of machines permeating the air, rising and falling in volume throughout the day. Steady truck traffic. Last night also, the site manager or staff forgot to turn off the huge floodlight casting is bright orange light down upon the the construction site, and into the bedrooms and homes of any household within view. Bright enough to cast shadows in rooms a block away. In some countries, construction companies pay a fee to each household in the vicinity of major construction projects to apologize for the inconvenience. Perhaps it is time for Vancouver’s industry to consider something similar. This is, after all, a world-class city. About a week ago, the crane was raised up to a new level, possibly the maximum height for the 22-storey tower. The construction is now visible from blocks away on Jervis Street, Robson Street and Davie Street, rising above almost everything else around it. 31-Jan-2014. A lovely Vancouver morning. Blue sky. Crisp air. Fresh snow on the North Shore mountains. And starting right at 7:30 am, workers at this construction site began making banging, hammering, and pounding noises that punctuated the otherwise relative silence. Another example of the costs paid by the community day after day for a period of a few years. What does the community get in return? People around every major construction site everywhere have the right to ask the same question, especially when politicians and public servants conspire to change the zoning and give the developer windfall profits by waiving levies, fast-tracking the decisions, and granting extreme bonuses of height (almost 400% increase) and density (almost 500% increase) as they did for Westbank/Peterson/Henriquez in this case. 27-Jan-2014. Construction is up to the 13th or 14th floor. This morning, as most days, the banging of work resonated through the neighbourhood. This afternoon and even after dark, now at 6 pm, the whining of concrete pumping equipment howls. Sounds like they are running at or above the 85 decibel limit. On other days, when you can see the blue sky, clouds of concrete dust billow into the air, evidence that these particles are indeed floating through the neighbourood and into local lungs. Workers wear professional masks. The quantity of dust entering residents’ lungs may be small, but it is not zero. It would depend on wind direction. The smell of curing concrete still permeates the neighbourhood. If you can smell it, you are breathing it. New smells now include some kind of chemical used typically for coating concrete surfaces. A strong, toxic smell. 20-Jan-2014. A construction worker walked directly from this site past four local residents, including three children, just paces from in front of the Gordon Neighbourhood house, and tossed a loud firecracker. It was reportedly the size of an illegal M-80 and so loud that a resident inside a nearby building later reported ears ringing. Based on the path of the worker, it appeared to be a targeted attack. Two senior management staff stated that the worker was indeed from their site. A police report was filed. 16-Jan-2014. Construction is up to about the 12th floor. Daily disruptions continue with noise, odor, traffic, and recently, lights installed on each floor that glare all night long into the neighbourhood. Today, electricians wired in a high-tech security camera system over the Broughton/lane corner, facing outward. The cameras overlook the mini-park in front of Gordon Neighbourhood House and has a good view up and down the alley, as well as over Broughton Street, including entrances of local residential buildings. The system has sophisticated motion sensors and is linked into a central monitoring system. Cameras were first installed in July at two locations (see 15 July 2013 entry), but this one was removed a few weeks ago. Two evenings ago, a local resident “went ballistic” on a rant against the construction noise — expressing personal sentiments to a few of the workers. Is this re-installation of the cameras a form of retaliation? We repeat our questions from July about invasion of privacy in the neighbourhood. How much can they see, in what detail, what is being recorded, and why? Can the cameras peer into individual apartments? Who is monitoring the videos, and who has access to the archives, for how long? Why are the cameras needed at this particular site, when they do not appear to common at other construction sites? While we wonder, here is another question. Are the individual and firms behind this project trying to hide in shame from the public and protect their brand? Around the city, on Westbank project sites, the company’s large name/logo sign is visible with an illuminated sign at the top of construction cranes, or on sign boards. Many construction sites proclaim the names of the owner, architect, and other firms involved. Why are Westbank Projects Corp, Henriquez Partners Architects, and Peterson Investment Group completely invisible on this project? Even the lead contractor, ICON Pacific, only shows its website as being “under construction.” Construction firm website under construction. Ironic. Even free websites, when preparing an upgrade, can prepare a test version while keeping the original online until they “flip the switch” and make the new website live. Something seems quite irregular when they remove all content and leave it this way. Perhaps more scrutiny of these companies is required. 6-Jan-2014. Today, Monday, wood hammering noises started shortly after 7:30 am, punctuating the morning quiet. The noise continued all day, as usual. In early afternoon, the sound of cement trucks and pumps running near the legal limit of 85 decibels began. Bright lights went on at sunset, a little after 4 pm. Concrete trucks continued til about 8:30 pm. They may not have violated the 85 decibel maximum, but they violated the quiet of the neighbourhood. This monstrosity has imposed its nasty impacts into every aspect of our lives. Our neighbourhood, our homes, our minds and our bodies have become a construction site. The clanging, banging, tapping, hammering, buzzing, and machine noises from 7:30 am until long after dark are an invasion of peace. Pity the home-bound, shift workers, self-employed, and stay-at-home parents. People returning from work at the end of a typical working day are also subjected to the construction disruption, just when they want to relax. The smell of concrete off-gassing is noticeable two blocks away. Concrete dust gathers in our homes, and possibly in our lungs. Glaring lights penetrate our homes. Hundreds to thousands are affected by the various impacts. Through December to today, construction work continued, typically to the maximum hours permitted by the Vancouver Noise Bylaw. The only days without construction were Sundays and statutory holidays — December 25 and January 1. 7-Dec-2013. As we are expecting record-breaking cold, the howling heaters are running again. Probably a thousand or two thousand people live within earshot. Sixty to 68 decibels near the site. Nice neighbours. 6-Dec-2013. Noisy heaters again at night. And workers left a bright construction flood light on all night again. A local speaking with site supervisors this evening were told that it was an error of the security staff who did not realize that they had to not only turn of the switch, but also unplug something. When the staff change, will they get the explanation. Supervisors said that staff have been instructed now to use flashlights and NOT turn on the floodlights until the sun comes up. Anyone facing a major construction project, add this to your list of points to negotiate with the developer in advance. Watch video here. 5-Dec-2013. Silent night? Not. Dark nights? Not. Westbank/ICON are now using loud heaters to cure the concrete, all night long. Hundreds of neighbours around this project discovered yet another unexpected impact of having a large development like this in a mature, densely populated neighbourhood. Staff on site confirmed that when temperatures dip below freezing, the contractors here will install heaters on the floor below the freshest concrete, to help keep it warm enough to cure. December 5 was the first night like this. As night fell, people noticed a mechanical sound, like a turbine running. At 1:30 am on Dec 6, two digital sound meters got readings between 60 and 68 decibels. Pity the residents of the adjacent buildings, especially at about the sixth floor level. The sound permeates the neighbourhood and is audible INSIDE buildings a block away. People are advised to use earplug and pillows over their heads if the sound bothers them. At 68 decibels, this is not a legal violation. But it is not nice, and not neighbourly. 4-Dec-2013. Banging and hammers started at 7:30 am. A jackhammer mounted on an tractor pounded the pavement much of the day, reverberating for blocks. Diesel exhaust hangs heavy in the air on this clear December day. Nice. 28-Nov-2013. This project is a blight upon the neighbourhood. The structure is now at about five or six storeys high. The powerful construction lights stay on until closing time at about 8 pm these days. This morning, the strong white light illuminating the top level was on at or before six a.m. Diesel fumes hang heavy in the air this afternoon. The concrete pumping equipment is running today again, as it was yesterday. Very loud. Probably above the 85 decibel limit. When the machines are not running, the sound of banging and pounding of metal and wood punctuates the otherwise-quiet neighbourhood, as well as the yells of workers. This project has enormous impacts on the community’s experience of its own homes and neighbourhood. When the work begins on the several hundred units at Beach Towers in the West End, residents should prepare themselves to apply pressure on the City and Devonshire Properties for written commitments based on negotiated conditions. 18-Nov-2013. Work has continued six days a week. The building is now up to about six storeys. Truck traffic. Noise. Odor. Yelling workers. Construction noises starting at 7:30 am sharp on Weekdays. People on shift work may have reason to be annoyed. Today work continues well after dark, with construction floodlights, and decibel readings of about 88 on the adjacent sidewalk. The legal limit is 85 at the property boundary. The smell of curing concrete permeates the air and is even noticeable inside buildings half a block away. This is what goes on within the impact zone of a major construction project in a mature neighbourhood. 12-Sept-2013. Noise levels are up again as two concrete pumps started operating at 7:30 am sharp. A few adjacent buildings had a notice from ICON taped to their lobby doors indicating that ICON warning of the big concrete pour today. It provided details on the road closures, said they had a noise exemption [which allows unlimited noise levels], and that they expected 70 concrete truck trips in one day. Earplug time. The neighbourhood this morning reeks of diesel fumes and exhaust. ACTION: Citizens should pressure the City and Westbank/ICON to post notices like this on the construction site wall so any member of the public can see it. Information is provided selectively only to targeted buildings. Westbank/ICON have not yet organized a single public meeting with the neighbourhood to communicate about this project. Bad neighbours? Update to 30-Oct-2013. Work has continued six days a week. As of today, the structure is at three or four storeys high. Work begins usually at the legally permitted starting time (7:30 am weekdays, 10 am Saturdays), often with machines, banging, clanging, etc. The smell of off-gassing from concrete drying permeates the neighbourhood. Workers take up local residents’s parking spots. Construction from equipment continues day to day, some days worse than others. Here is one episode on a darkening Wednesday evening. Up to 11-Sep-2013. Work has continued. Cement pouring has been somewhat quieter. Though neither the City nor Westbank/ICON say anything, public scrutiny and pressure has probably forced some changes. Smaller pouring jobs are done with a bucket and the crane. ICON has hand-built a noise dampening panel of plywood and insulation to place around the concrete boom truck when used. This has helped somewhat to reduce noise. Today, workers have completed re-bar and wiring for the ground-level concrete slab. Junior and senior project staff continue to park without parking permits, or take nearby two-hour parking spots in this neighbourhood. 24-Aug-2013 (Sat). Work has been steady over the past week. Workers have been observed parking without permits in permit-only parking zones, and also playing the game with 2-hour limits in 2-hour zones. Noise has been on and off. The day usually starts at about 7:30 am with a loud electronic buzzer. Today is a lovely Saturday in this residential neighbourhood. For the first time, the concrete pump boom truck had a plywood shroud around the engine at one end, dampening the sound to some extent. There has been no communication from the contractor or the City, but it appears this may be a response to noise complaints. But it is still loud and dominates the soundscape, probably just slightly under the legal limit of 85 decibels. A worker hired by a contractor was just a few paces from the machine, working without hearing protection. 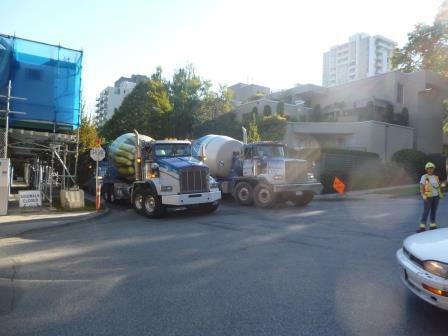 On the otherwise quiet residential Broughton and the Comox “Greenway” street, up to three large concrete mixer trucks and the large concrete pump truck dominated the streets. Saturday strollers on their way to the Farmer’s Market had to navigate around and wait while the heavy equipment moved. 16-Aug-2013 (Fri). See video of another apparent violation of the Vancouver Noise Bylaw. The Bylaw maximum is 85 decibels. This sound meter reading goes up to 95 decibels at one point. The concrete pumping work is expected to go on for months at this site. Since this equipment is in standard use, is the entire industry in Vancouver incapable of complying with the City’s Noise Bylaw. What is the City doing about it? What is the industry going to do about it? We have asked the City for a written response. No reply. 10-Aug-2013 (Sat). Watch video here to see the digital sound meter go over 100 decibels near this construction site. Just after 10 am on a lovely summer Saturday morning, several large concrete trucks fed a concrete pump truck. The noise on a public sidewalk near the site was well over 90 decibels as parents walked past with young children. Bird song was drowned out. Half a block away, were two yard sales attracting many neighbours. Cyclists rode by on the Comox-Helmcken Greenway. Noise permeated the neighbourhood, audible a few blocks away, even as far as the West End Farmers Market. Big truck traffic passed pedestrians on a stroll. Anyone within a few blocks of any development or rezoning project in Vancouver, take note of the real experience. Call for improvements in the construction industry and in City bylaws. 7-Aug-2013 (Wed). The past several weeks senior and junior staff from this Westbank project have been playing games with resident parking — staying all day in a two-hour parking zone, moving the vehicles just before the two-hour limit, or parking in permit-only areas with no permit. Can one of Canada’s biggest developers not afford to provide legitimate parking for all of its workers? This is another example of the impacts of a large project like this on a residential neighbourhood. Today is another cement pumping days, with the Quorum truck reaching 95+ decibels on a sound meter. This equipment appears unable to comply with the Vancouver Noise Bylaw maximum of 85 decibels. 1-Aug-2013 (Thursday). In the last couple weeks, trucks have violated permits by blocking roads, and locals have complained of morning and daytime truck traffic noise and vibrations. Also, the new surveillance and alarm system has awakened locals in the middle of the night, See this video, for example. 22-Jul-2013 (Monday). A concrete pumping rig by company Quorum is a blight on the neighbourhood, with noise readings of about 68 decibels a block and a half away, running most of the day. Residents are also complaining about the noises of buzzers and alarms periodically sounding from the site. This would otherwise be a quiet day in the residential neighbouhood. Thousands of people are within earshot. People are also complaining about Westbank and ICON’s use of some kind of alarm system that sometimes interrupts the night. It appears that they have chosen to rely on electronic monitoring, which sets off alarms when a cat or skunk moves near the site. Lights flash and alarms sound intermittently until a security guard arrives, apparently 30 or 40 minutes later. Anyone within earshot of a major rezoning and development, take note. 19-Jul-2013 (Friday). This is a day of evidence of how neighbourhoods are victimized by the construction industry and City of Vancouver. We record observations here for future reference. Site owners Westbank and Peterson, architect Henriquez, contractor ICON and the City of Vancouver are ultimately the perpetrators. The local residents and members of community, including seniors, mothers and young children using the adjacent Gordon Neighbourhood House, are the victims. Today a long and loud concrete pumping operation made it unpleasant for hundreds to thousands of locals within one or two city blocks to be at home or outside despite the beautiful summer weather. The contractor provided no public advance notice of its schedule. Comox Street and the rear lane were closed to traffic, with no prior notice. Equipment working included a concrete pumping rig and five concrete trucks at one time. 16-Jul-2013 (Tuesday). Since about a week ago, at 7:30 am a loud electronic buzzer sounds at the worksite. Probably a couple thousand residents are within earshot. Whether or not they want to hear it, they get a wakeup call at 7:30. This is yet another impact on the community. This morning at 8 am ground tremors emanated from the worksite. The companies have installed security cameras at two corners of the site, raising questions about invasion of privacy in the neighbourhood. How much can they see, in what detail, what is being recorded, and why? Can the cameras peer into individual apartments? Who is monitoring the videos, and who has access to the archives, for how long? Why are the cameras needed at this particular site, when they do not appear to be used at many other construction sites? The companies have put more trailers up above the sidewalks, and appear to be trying to “beautify” the site — replacing link fencing with painted plywood, with occasional peep holes into the site. Concrete pumping trucks parked on Broughton make noise approaching 100 decibels, audible blocks away. The City noise control inspector denies that this noise level is even possible. The noise from equipment at 7:30 pm was so loud that the Gordon Neighbourhood House had to close all windows in order to hear each other speak in the meeting room during the Annual General Meeting, despite the hot summer weather and the otherwise lovely evening. Yet groups of children, and young mothers with infants pass within feet of the trucks on their way to Gordon Neighbourhood House and beyond. Workers wear noise protection, yet neighbours do not. Workers are taking up parking spots from local residents by parking in both permit and non-permit parking. Ground vibrations periodically permeate from the site. Today, for example. Construction noise of machines, saws, hammers, etc., often starts at 7:30 am sharp. Today was one example. This major construction project in the midst of a densely populated residential area brings construction impacts into everyone’s bedroom and kitchen. Visitors to Vancouver are noticing and complaining about the impacts of construction. See public comments here (http://cityhallwatch.wordpress.com/2013/04/02/demolition-construction-impacts-affect-all-act-now/ and http://cityhallwatch.wordpress.com/special-topics/demolition-its-impacts-recycling-and-vancouver-building-bylaw/), and join our long-term project to reform the Vancouver Building Bylaw to bring Vancouver regulations up to a higher standard and make the entire construction industry more respectful of people and neighbourhoods. The current regulations are strongly biased in favour of the construction industry. Monitoring and enforcement are weak. People should also watch for the possible involvement of criminal organizations in the construction industry. Who are these companies bringing into Vancouver neighbourhoods? The week of July 8, at last ICON posted a site safety plan — displaying locations of equipment and safety stations on site. Were they in violation with regulations until now? 30-May-2013 (Thurs). Company changes erection plans yet again: After further discussion with our contractor and the City, we have opted to install the crane in only one day to minimize the duration of street closures. The crane installation will be on Monday June 3. The road closures will commence at 7:00AM and end at 7:00PM. 29-May-2013 (Wed) Lots of noise and ground tremors this week. Concrete is being pumped into the foundation. Scores of tandem dump trucks come and go each day. A solid rumble with occasional crashes permeate the neighbourhood throughout the day, morning through closing time. Also, the project site fence now has a revised notice of erection, dated 29 May, as follows: Due to an issue encountered during testing of the crane, we will be unable to install the crane on Thursday, May 30 as the previous letter stated. The revised dates for the crane installation will be on Monday June 4 and Tuesday June 5. The road closures will commence at 7:30AM and end at 5:00PM. We are spreading the installation over two days in an effort to have the streets and parking available when people get home from work. 27-May-2013 (Monday): Two excavators working, tandem dump trucks being loaded, two large cement trucks parked and operating on Broughton, beside the site, while a heavy duty concrete pumping truck operates on the corner. Noise levels at one random moment were at 96.9 decibels. A formal complaint went to City noise bylaw inspectors. Mothers on their way to Gordon Neighbourhood House family programs had to cover their infants’ ears as they walk past the site on the other side of the road, where decibel levels were at 85 to 90 decibels. Noise bylaw was violated. Was Westbank fined? If their machines cannot operate within the limits of the noise bylaw, what is the point of having the bylaw? Is enforcement of bylaws selective? If some companies pay fines and other do not, where is the fairness in our civic government system? 24-May-2013 (Friday): Work the week of May 20 continued. Two excavators on site. The larger one was moved up to the lane, while the other works in the pit. Working together, they are finishing up the excavation work. Tandem trucks now completely block the back lane during loading. We suspect this has not been permitted by the City and that the traffic routing is being done without the City’s knowledge. Seeing the amount of heavy equipment involved in demolition, excavation, moving of material to this point, just to get this far, one wonders about the total fossil fuel emissions that will be required to build this 22-storey tower. Is Westbank aware of its ecological footprint? How much effort is the City doing to track greenhouse emissions driven by its urban development policies. Aiming to be the greenest city in the world by 2020, one would expect an honest evaluation of lifecycle GHG emissions per dwelling unit or resident. Where is evidence of that effort to know the facts? This week also, heavy trucks started loading re-bar into the pit. A large concrete pumping truck with stabilizer extensions and a crane appeared onsite, along with two large cement trucks, as pouring of the foundation began. 16-May-2013 (Thursday): This week, Monday to today, work has continued. Machines generally start exactly at 7:30 am, permeating the neighbourhood with construction noise at about 80 decibels. The hole in the ground is about four storeys deep. Two large excavators remain on the site. Large metal containers now cover all the scaffolding over the sidewalk on Broughton Street. is it an optical illusion, or is the sidewalk actually slanting down toward the hole more than it used to? Ground vibrations rock buildings intermittently, emanating from the construction site. Still today, the contractors have failed to reinstall a site safety map. WorkSafe BC probably requires the map to be posted publicly, to indicate the layout, safety stations, access for emergency vehicles, etc., but the sign was removed at the end of March and is still absent. In recent days, tandem dump trucks continue to arrive via Davie Street to Broughton, turn right up the lane, then back into position. Other large trucks have come by as well, including large cement mixers and loaders. 11-May-2013 (Saturday): Excavators start up at 10 am on an otherwise quiet Saturday morning, destroying the peacefulness of the neighbourhood. Ground vibrations are felt and heard a couple blocks away. 9-May-2013: Bright lights are installed under the scaffolding, which now runs over the sidewalks on both Broughton and Comox Streets. The roughly 40 lights stay on 24 hours a day. A night, they shine into the surrounding area, creating a visual disturbance on the community, changing the character of the locale. Are they required even during the daytime? It seems to be wasteful. Do LEED standards have anything to say about this? 7-May-2013: Shoring drill equipment is removed from the site. Two large excavators remain. The hole in the ground is now about four storeys deep. 3-May-2013 (approx): Shoring drills are still being used. Citizens made formal noise complaints about Vancouver Noise Bylaw violations. A digital sound level meter SL-814 took readings of over 90 decibels between 9:30 am and 10 am, peaking at 99 decibels, right at the property line. The site foreman standing there confirmed that he had taken a reading of 90 decibels. At this time, a young mother was passing by with an infant on the way to the Gordon Neighbourhood House. Is this safe for young ears? When the shoring equipment was not running, the noise was steady at 85 to 88 decibels. The regulated maximum is 85 decibels. City bylaw enforcement personnel were requested to investigate the complaint, enforce the bylaw, and apply penalties in event of a violation. Meanwhile, the site foreman and other senior site personnel have been observed taking photos of a citizens while they are on public property. For what reason? What are they doing with the photos? Would citizens perceive this as intimidating and invasive? Is it appropriate for construction workers and employees of prominent Vancouver construction corporations to be taking photos of citizens in their own community? I also request that you confirm my privacy is protected in making this complaint. 30-Apr-2013 (Tues): The noise bylaw exception expires at the end of the day today. Citizens inquiring never were able to find out exactly what the City’s criteria were to grant the exception, which completely removed maximum noise limits but did limit the hours when that noise was permitted. Officials did not provide any complete answers. It appears the decision-making system is somewhat arbitrary. A contractor asks for an exception, does not need to provide evidence or justification, and gets the exception permitted with no requirement for compensation to the city. In this case, we have observed and documented violations of the bylaw exception by Westbank/Peterson/ICON, but to our knowledge no penalties were imposed. On this, the last day of the noise bylaw exception, the machines were particularly noisy. 29-Apr-2013 (Monday): For the past couple weeks, work has fallen into a routine. Contractors generally stay within regulated limits — as far as local residents can tell. Occasionally ground vibrations are felt, and noise rises to levels that cause a disturbance. Regulated hours are generally being observed. Trucks waiting on Davie Street have been noticed to have their engines turned off. These are just general observations. Note that the official “exception” to the Noise Bylaw ends April 30. Today, April 29, the sound of two shoring drills was particularly loud, probably exceeding noise limits — but the exception issued by the City staff removed all restriction on noise levels until April 30. ICON and Westbank have still not contacted residents of most buildings within a one-block radius. Though their notices were see on a couple local buildings only. The site safety plan one would expect to see posted at a construction site has been absent since about a month ago. Does this violate Worksafe regulations? 15-Apr-2013 (Monday): Excavators started working at 7:30 sharp. Major ground tremors felt throughout the morning. Loud whining of shoring drills. 13-Apr-2013 (Saturday): Excavator operating intermittently from 10 am onward. Major ground vibrations are felt a couple blocks away from about 1 pm onward, accompanied by loud crashing noises from excavator, reverberating through the neighbourhood on an otherwise quiet weekend. 11-Apr-2013: Vancouver Police this morning investigated a violation (VPD file number VA13-53409) of the Noise Exception (see below) to the Vancouver Noise Bylaw and confirmed to a resident that workers had indeed violated the conditions of the exception by engaging in drilling shortly after 7:30 am. The exception permits drilling only after 8:30 am. The site supervisor apologized to the police officer. Citizens are encouraged to contact the City requesting that the permit now be cancelled, as Westbank/Peterson/ICON have violated the conditions of the permit, and the letter states that the “permit is subject to curtailment or cancellation if reasonable complaints are received.” Write to Will Johnston, Director of Licences and Inspections, at info@vancouver.ca. Use both addresses, 1401 Comox and 1061 Broughton. 10-Apr-2013: Residents learned that the Noise Bylaw Exception letter (see below) was erroneous. The particular line of “ no other construction is allowed during exempted hours” should have been removed from the exception. Also confirmed, the exception removes any upper limit on the maximum noise level, whereas the regular limit is 85 decibels. 9- Ap-2013: At about 8 am on April 9, three tandem trucks were stationed along Davie and Broughton Streets. One was idling beyond the 3 minute maximum. Noise from shoring equipment audible three blocks away, within earshot of thousands of residents. 8-April-2013 (Mon): Neighbours heard two machines running at 7:30 am sharp. Loud. The loud whine of shoring equipment echoed through the neighbourhood starting at 8 am sharp. Westbank and ICON work to the very limits permitted by bylaw. A series of ground tremors were felt a block away at 11 am. Doors and shelves creak and vibrate in response. Cat-owners living in the vicinity of 1401 Comox are reporting that their pets are showing signs of stress, for example starting to urinate inside the apartment — probably due to the construction noise. This is just another symbol and evidence of the negative impacts of an out-of-scale project in a densely-populated neighbourhood. The civic system makes no allowance for these impacts — which are not even on the radar for advisory bodies like the Urban Design Panel, Development Permit Board, City planners, or even City Council. 6-7 April-2013: Saturday and Sunday. Thankfully, not machine was running. Birdsong could be heard both days. 5-April-2013: Loud work begins full force at 7:30 am. Sound level meter readings from morning to afternoon were coming in at over 106 decibels, from shoring equipment, two excavators, and tandem trucks — all operating at the same time. A building entrance across the street showed readings of 88 decibels. 4-April-2013: Regular machine work all day, gets quiet in late afternoon. 2-April-2013: Work continued, starting at 7:30 am. Noisy shoring equipment. Workers spill oil on public road, fail to clean it up. For the second time, neighbours do the clean-up. Things got quiet at 5 pm, thankfully. Fuel truck observed fueling at 10 pm. Site safety plan has been removed. What’s going on with that? 31-Mar-2013 (Easter Sunday): No work today, and thousands in the community were reminded what it’s like not to have a major construction project in the neighbourhood on a glorious spring day. 30-Mar-2013 (Saturday): A miracle occurred. Though permitted by bylaw to work today Westbank/ICON did not have workers out on the site. 29-Mar-2013: Good Friday, a statutory holiday. Thankfully, there were no bylaw violations today. Neighbours could again hear the birds sing. 25-28 Mar-2013: On two locations on the fence appears a letter from City of Vancouver Director of Licenses and Inspections, indicating ICON West Construction Corp. [which is doing the construction for Westbank/Peterson] has been given an exception of noise bylaws to April 30, permitting “drilling anchors for shoring system” from 8:30 am to 5 pm [supposedly six days a week] and “no other construction is allowed during the exempted hours” [Does that really mean what it appears to be saying?]. “Vehicle movements should be arranged so as to minimize the sound of backing-up warning devices. Crews are to take appropriate measures to eliminate all unnecessary sound.” “It is also understood that ICON West Construction Corp. will notify all residential accommodations within one block radius concerning this work. ICON West Construction Corp. agrees that every effort will be made to keep noise to a minimum and this permit is subject to curtailment or cancellation if reasonable complaints are received.” OUR OBSERVATIONS: Westbank and ICON have violated these conditions since March 21. No effort has been made, to our knowledge, to notify “all residential accommodations within one block radius.” The companies continue to use the cheapest shoring method and equipment, which produces the greatest noise. Excavators have continued to operate while shoring equipment runs. Trucks have been recorded on video idling for fifteen minutes in the lane, 12 minutes over the idling time permitted by bylaw. The problem is that the City typically responds to Building Bylaw and Noise Bylaw complaints a few days after the violation. We have obtained digital sound level meters — and one quick trial along the construction site produced decibel readings of over 90 dB. The permitted maximum is normally 85. 24-Mar-2013: Thankfully, no work, no noise, as required by City bylaws. Only once a week are neighbours permitted to hear the birds. 23-Mar-2013: Work continued this Saturday. 22-Mar-2013: Ground vibrations in community. Shoring and other heavy equipment noises were in full volume by 8 am, reverberating for blocks into the minds and ears of a couple thousand people in the impact zone. Thankfully, a tandem truck actually had its engine turned off at 7:30 am while waiting for excavators to get started. Note that City bylaws do not require continuous monitoring or reporting of noise and ground vibration disturbances. Inspector responses to complaints typically take three days. The current system is dysfunctional, at least in terms of the public interest. 19-21 Mar-2013: Machines begin with a vengeance at 7:30 each morning, as Westbank/Peterson/ICON continue with the low-cost but noisiest method of shoring the excavation wall, now about two stories deep. Ground tremor continue intermittently throughout the day. Heavy traffic in lanes and nearby streets as it gets rerouted around this site and the ongoing simultaneous work on the Comox “Greenway” and sewer/water main repairs. Meanwhile, serious injuries are avoided at nearby tower construction by same architect Henriquez Partners Architects on March 20 as glass and construction debris crash to the ground at Bidwell and Davie from a 21-storey construction site. On March 20, children from Gordon Neighbourhood House were playing just five meters from a tanker truck parked beside the school bus as it refueled the heavy equipment. March 21 about 25 young children played outside in the mini-park as tandem pickup trucks idled a few meters away and excavation equipment spewed carcinogenic diesel small particulate matter (SPM) into the air. Westbank has still ignored requests for a public meeting to explain the construction schedule and safety measures to the neighbourhood. 18-Mar-2013 (Mon): Noise and ground vibrations began with a vengeance today. Two excavators, shoring machines started their motors at 7:30 pm sharp. Westbank/Peterson/ICON have apparently decided not to switch to a quieter shoring technology — saving their costs, but causing greater disturbances on neighbours. Ground tremors happened throughout the day, feeling the size of small earthquakes in some nearby buildings. After tremors, some people feel “ghost” aftershocks in their feet, a subjective phenomenon known as “yoshin” in Japan where earthquakes are common. 16-Mar-2013 (Sat): Mysteriously quiet today. Did Westbank/Peterson/ICON decide to avoid disturbing the neighbours after what happened last Saturday? 15-Mar-2013: Westbank/Peterson/ICON crews started up the machines at 7:30 am sharp, taking advantage of the maximum permitted by Noise Bylaw. Ironically, a http://www.reliablehearing.com bright yellow truck is parked beside the site to test workers’ hearing. Walking near the site, subjective opinion is that the noise is about 85 decibels at site boundary. The area around 1401 Comox 1061 Broughton is like a construction disaster zone — construction on Nicola at the Darling Mansion, sewer work by City workers, water main construction by City workers, and construction of the Comox “Greenway.” Roads are blocked in every direction, water lines run across sidewalks, large holes have been dug in about 30 different locations. Roughly thirty heavy machines are running at any one moment. But there was one sign of the beauty of hope and nature — CoV workers were replanting a tree, just across from 1401 Comox. A carpinus bet fastigiata DO#4200 RFQPS20120868. Located right close to the Canada Post mailbox, this tree will need to be watered by neighbours during the summer, and one day will stand tall. 14-Mar-2013: Ground tremors felt a couple blocks away just after 8 am. Excavation is now down to depth of about 2 storeys. 13-Mar-2013: Intermittent earth tremors felt a couple blocks away before 11 am. Large signs appeared on two corners of the site explaining the Noise Bylaw — apparently an enlarged version of a City of Vancouver web page. Is this a precedent for a contractor to put up a sign like this? Perhaps an acknowledgement that Westbank/Peterson/ICON have at last become aware of the huge disruptions they are causing in the community. 12-Mar-2013: Three tandem trucks were found idling along Davie Street at 9 am. Ground tremors roughly Richter 2 felt a couple blocks from 1401 Comox at 11:40 am. 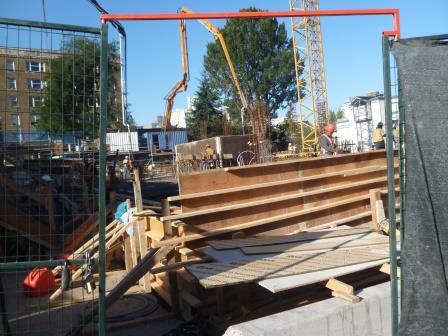 Note that Vancouver has no way of monitoring or regulating ground vibrations from construction sites. Scaffolding over the sidewalk has been moved again. 11-Mar-2013: Traffic chaos occurs near site, with bottleneck of three tandem trucks. City of Vancouver Engineering staff intervene. This was one of the noisiest machinery days since Westbank/Peterson demolished St. John’s Church in 2011. Ground tremors felt. Machine noise highly audible nearly three blocks away. Work stops comparatively early, at about 6 pm. Someone has written “St. John’s Church” on cement blocks all along the scaffolding. 9-Mar-2013: Excavator works from 11 am til 7 pm or later, well after dark. Woman intervenes and convinces excavator operator to desist early, though he emphasized bylaw permits work til 8 pm. Below is to be edited. 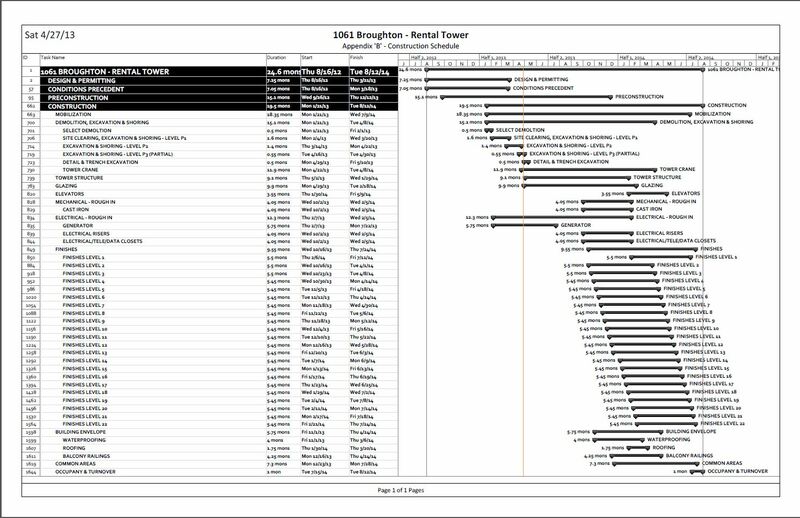 Above is chronology of construction in 2013. Application was made public in November 2009. The first time most residents heard about it was by discovering it on the front page of The Province newspaper. More details of the chronology will be added to this page. To put this whole discussion about the future design of our community into perspective, we need to look at history. This page provides basic information on the history of the West End (including from the zoning perspective), and the actual St John’s church site in question today at 1401 Comox. Note: Newest is at the top. List will be updated. 22 April 2010. 7-8:30 pm. Residents will hold a community “town hall meeting” to share information and opinions. All welcome. 20 April 2010. Westbank/Peterson/Henriquez plan a second Open House, 4-7 pm, at Coast Plaza Hotel. 8 April 2010. Planning and Environment Committee meeting. Public may speak to Councillor Woodsworth’s motion. 24 March 2010: The city’s Urban Design Panel reviews the 1401 Comox rezoning application for the second time, and supports the application, with minor tweaks, and without much discussion about the bigger issues. See “Analysis” tab. 14 March 2010: A hundred people join a neighborhood info event on the corner of Cardero and Harwood Streets (Beach Towers), the site of another soon to be proposed STIR project (this time 23 stories of market-priced rentals likely to be subsidized at $100,000 per unit). 1 Dec and 10 Dec 2010: Council meeting hears supporters and opponents of a rezoning at 1215 Bidwell, also under the STIR program. Architect is Gregory Henriquez. Many speakers addressing council also happen to be closely affiliated with either Henriquez or Millennium. Vision Vancouver votes as a bloc to approve rezoning, with other councillors opposing. 9 Dec 2010: Media event by citizens at 1215 Bidwell (another STIR rezoning site), demanding the existing community plan and zoning be upheld in the West End until a new comprehensive plan is developed. 24 Nov 2009: Open House on this 1401 Comox application held at Coast Plaza Hotel. An all-time record turnout (for a rezoning open house) of over 300 people view site model and plans, talk to Henriquez (architect), Westbank (developer) and city staff. 21 Nov 2009: West End Residents Association holds public forum on rezoning in the West End, attended , to discuss 1215 Bidwell and 1401 Comox rezoning under the STIR program. When asked for a show of hands of who wanted a 22 storey tower at 1401 Comox, all but one partipant voted against the tower. 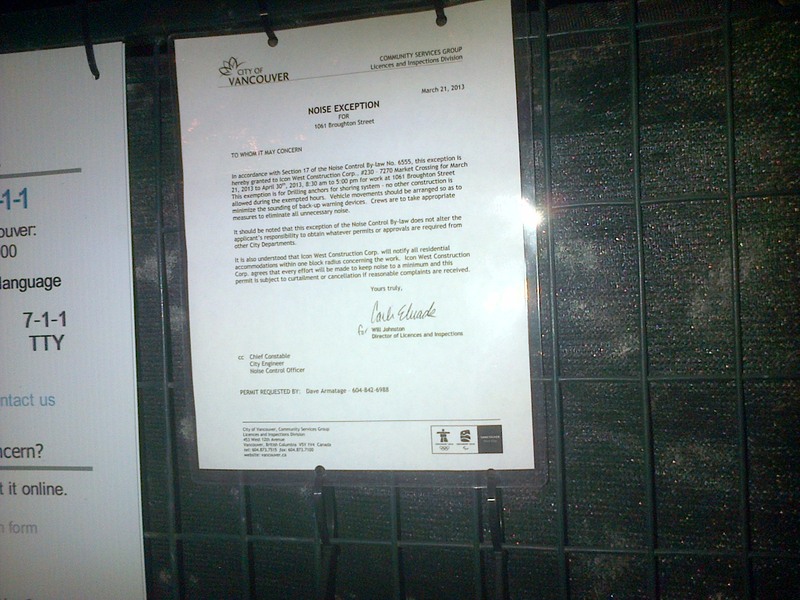 3 Nov 2009: City of Vancouver sends notice of rezoning/development application to surrounding two blocks only. 7 Oct 2009: Official date of joint rezoning/development application for nearly 400% increase in height, and 500% increase in density, under the STIR program. Note that there is absolutely no way this radical rezoning proposal would be considered by the city’s Planning Department if the STIR program did not exist. 1 Sep 2009: Sale closes at $4,250,000. Purchased by Westbank Projects Inc and Peterson Investment Group. 18 July 2009: City Council passes bylaws to enable the STIR program. 18 June 2009: City of Vancouver Planning and Environment Committee endorses the STIR program. Vision Vancouver affiliated councillors vote as a block, in favor. Two councillors vote against (and one is absent). 25 April 2009: Mayor’s Roundtable on Rental Housing discusses how to create more rental housing in Vancouver. This meeting was a critical step that led to the creation of the Short Term Initiatives for Rental Housing (STIR) program, which was adopted by the City less than 2 months later, on June 18. Note that Gregory Henriquez (architect of 1401 Comox project) and Ian Gillespie (CEO of Westbank Projects, and the new owner of St John’s Church at 1401 Comox) both participated in this meeting. Councillor Raymond Louie was apparently very influential in the initiative in ensuing months, ramming the policy through council quickly. In discussions after this meeting, leading up to adoption of the STIR policy, no one was given any indication that extreme increases in height and density were going to be considered. The sole example in the April 25 presentation documents was for a four-storey wood frame building on a major transit corridor in East Vancouver. 1925: Union of Presbyterian, Methodist and Congregational churches formed the United Church of Canada. St. John’s became home to the Seaforth Highlanders of Canada and was known as a strong mission church. The West End is located in the most densely populated, intensively active portion of the Lower Mainland. It shares the peninsula with the Downtown, Central Business District and Stanley Park. Until the turn of the century, the West End was only sparsely settled, due to its distance from the old Granville Townsite (Gastown). Through the 1890s the forest was logged and gradually replaced with grand Victorian homes for upper-income families. With the CPR’s development of Shaughnessy in 1910, the West End’s role as a “high-class” residential area declined andthe community’s second stage of development began. Apartments were built, homes along the Robson, Denman and Davie (all streetcar lines) were redeveloped as shops, and larger homes were converted into rooming houses. The community’s first apartments were constructed on the streetcar line that ran down Robson Street… City building regulations, which lasted until 1956, restricted these early masonry buildings to six floors, and wood frame buildings to three floors. During the 1930s and 40s, the third wave of apartment development occurred. These were low rise structures with impressive Art Deco and Tudor-inspired facades. They were designed to give the community an air of permanence and respectability. The 1950s brought the fourth stage of redevelopment to the West End. These changes were mainly in response to zoning changes and technological advancements which allowed for cheaper and better multi-storey construction. The majority of high-rise apartment development occurred between 1962 and 1975 where more than 220 highrises were built. This building boom created the skyline that we are familiar with today. In the 1970s, and again in the 1980s, resident’s expressed concerns changes in their community. In response, City Council initiated local area planning programsinvolving West End residents, local business people and City staff. The construction of this building has gone overdue by two months already and it is outraging everyone within a four block radius. Do you have any idea what it’s like to be jack hammered awake every morning at 7:30 IF they decide not to start early? I’ve lived across from this gaudy monstrosity since March 1st. That’s 7 months being shaken alive by the incredible rumble of cement mixers, cranes, drills, saws, and profanic shouts even on some Sundays, pounding, pounding, pounding at decibels never considered. And I work NIGHTS. And there have been nights at 1:30 AM where I’ve had to go across to tell people who are drilling in the parking garage to desist because it echoes to high heaven. It isn’t just that the community residents, who have nothing to gain by this obelisk’s erection, must endure the shrieking, psychological attacks well passed the time it should have taken to have this thing up. They changed the address because they must’ve realized they’d put the door on that side. Ladies and gentlemen, I know condos are the present, but I can hope they are not the future. This isn’t simply noise. This is shake your home every day, shatter your dreams, and not letting you sleep for 209 days. Close your window? Great, now add the sound of their vibrations. This is no way for people to live. But who cares, right? Profits before people. Oh yeah, there was even that day where they knocked down our parking lot wall by accident. Yeah, that was fun.